Yesterday morning when I logged onto my favorite social networking sites I was immediately faced with the sad news of the death of Armando Montano, a 22-year-old Associated Press intern. Montano, who was working this summer as a news intern for the AP bureau in Mexico City, Mexico, was found dead early Saturday. Montano’s body was found in the elevator shaft of an apartment building near where he was living. The circumstances of his death are being investigated by Mexican authorities. Even though I didn't know Montano, news of his death hit me hard and not just because he was so young. In the summer of 2003, I too was an AP intern. Montano and I were also both part of the Chips Quinn Scholars program, which offers journalism students of color hands-on training in journalism and mentoring by caring news veterans. Journalism is changing, newspaper circulation is falling, and people are even turning away from broadcast news. So why do I want to be a journalist in this day and age? For the thrill of getting a hot story. So I can inform the public about wrongdoing. So I can be part of a system that represents and protects democracy. 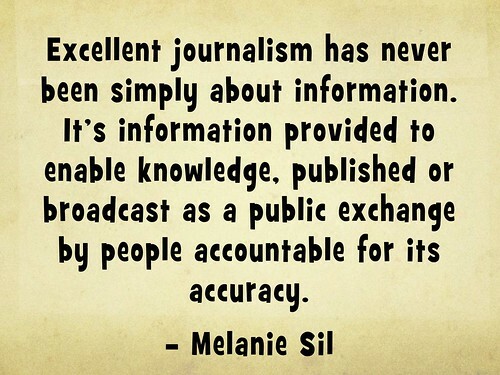 Just because journalism is changing doesn't mean that we have to discard its best principles. From where I stand — a high school teenager looking for my life's direction — those principles are easy to find. Chuck Dean, senior political reporter for The Birmingham News, shared his reflections on Montano's words yesterday on Twitter and said that though he's been a reporter for a generation he's "never read better words about why good reporters do what they do or better advice as our craft changes." I couldn't agree more. Regardless of your profession, there is a valuable lesson to be learned here from someone who was only beginning to live his life. No matter how circumstances shift and the landscape around you changes, hold on to principles. Ask yourself why you pursued this profession, this passion, in the first place and figure out a way to carry out that purpose no matter what. Thank you, Mando, for your wise words. Those who have some better memory with mando montano they really know how good they are. Here http://www.capstonetitles.com/biology-capstone-project-titles/ you will get the capstone titles writers for your biolofy subject. The whole stories will tell you a lot of facts on our life there though. read here and get some more help on the marketing side as we expected from as you can get help for marketing side with interactive agencies. one of the finest love writings I have been read after so many of times. In this site http://www.manuscripttyping.com/about-us/ there has manuscript writing service and you can get things on it.